Bora Bora, more like horror horror! (Well at least for our first two nights here). We had a very quick sail over from Tahaa in rising winds knowing that the weather was about to change for the worst. 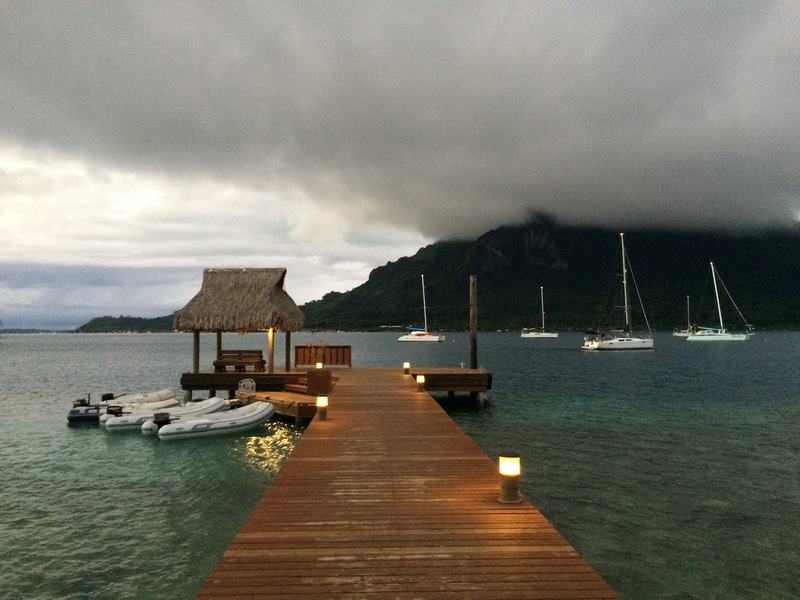 Our plan was to get over to the Bora Bora yacht club, which would hopefully offer us shelter, and then pick up a mooring. We got through the pass just as the wind kicked up and rain fell hard, ok so we didn’t quite time it right but luckily the rest of our plan was solid. Once tucked in around the headland where the Bora Bora yacht club was located the winds dropped and we picked up the last mooring! From that point on the rain fell, the wind blew, the place turned to mud. In fact it’s pretty much the worst weather we’ve seen on this trip. 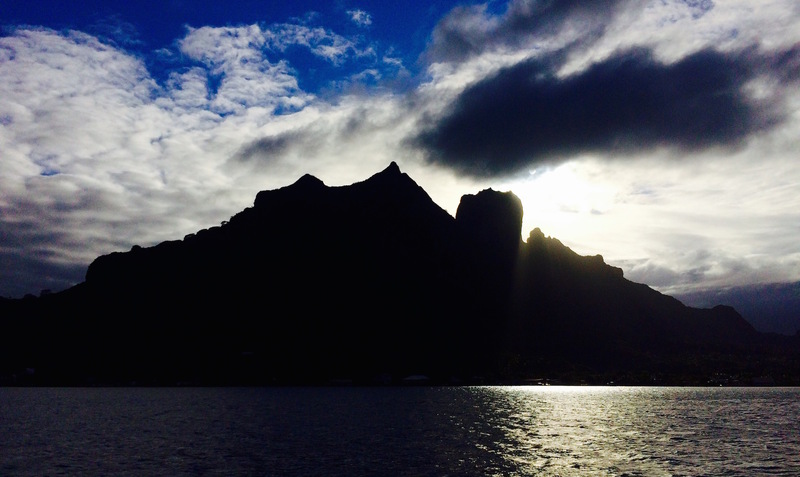 You couldn’t see the famous twin peaks of Bora Bora let alone explore the islands and take in the sights. We did what we could on board, and checked out a few places to eat in the evenings but after a while cabin fever started kicking in. One positive to come from all the rain was our new water collection system, or WCS as I’ll now refer to it. The idea was to collect the water that drains off the decks and is eventually led to the back of the boat where it pours into the sea. 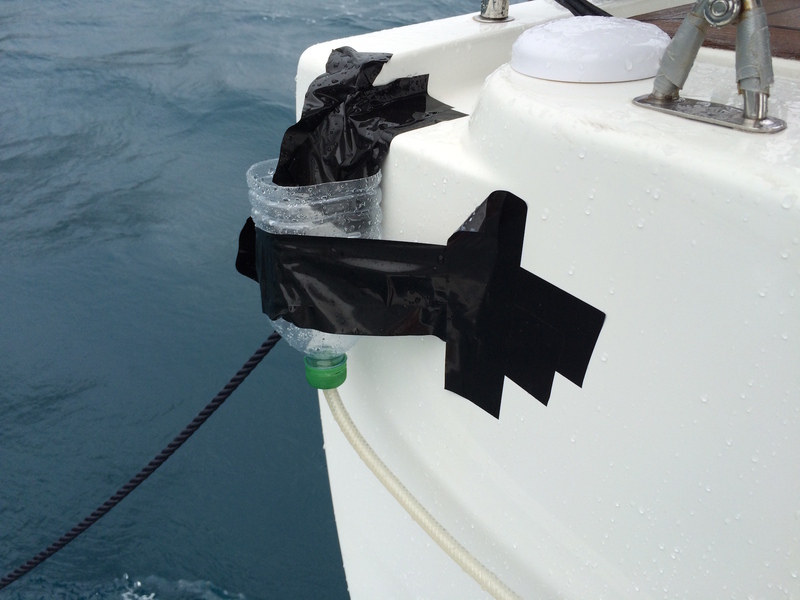 The design evolved quickly from a somewhat basic v1.0 (a plastic box taped on the back of the boat which leaked more than it collected) to the, dare I say it, elegant high end v2.0 (a plastic water bottle taped to the back with a hose stuck through the lid). Ok it might not look like much but WCS v2.0 collected over 100 litres of water in a few hours and filled our tanks back up. There are plans to market the unit worldwide, if any investors out there are interested and want to give us the $10,000,000 estimated development costs we’d be pleased to hear from you. Just to top it all off our outboard stopped working again. After waiting all that time for the replacement part in Tahiti it just stopped working and throwing up error messages. ARGHHHHHH!!!!! After 2-3 days the front passed through, the skies cleared, my mood improved, and we finally got to see what all the fuss was about. Bora Bora is a small little place, stunning landscapes, nice beaches, amazing restaurants, and the most high-end hotels we’ve ever seen. The small village was buzzing once we managed to get our walking shoes on and explore. The Heiva Festival was in full swing. This yearly event is the highlight of their calendar here. Locals from all the villages on the island fight it out in dance competitions, spear throwing, singing, dug-out canoe racing – it’s amazing to watch. It’s very competitive but as everyone knows each other here it’s all done in very good spirits. 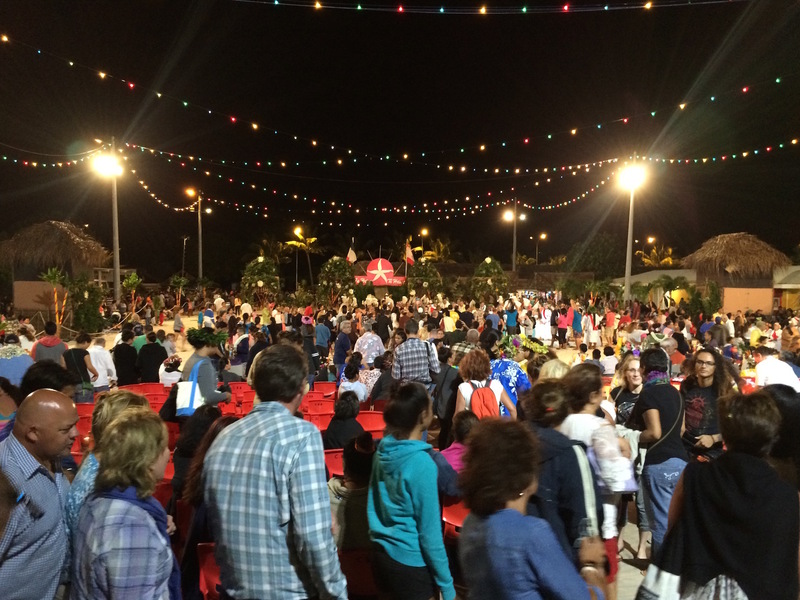 The dancing in particular was great to watch. Hip shaking to the max! The winners go on to represent Bora Bora over in Raitea and then Tahiti. Good luck guys and gals! After a few more days over at Bora Bora Yacht Club we motored over the bay for a mile or so to the Bloody Mary’s moorings. Just as we approached a boat left and we picked up his mooring which was about 50m from the dock. With no outboard this was the first bit of luck we’d had in about five days. We had a meal there that night, which we later found out the locals call Bora Bora McDonald’s. Yes it’s very American but we enjoyed it there and had some wonderful food and made good use of the half-price happy hour. The location of the moorings allowed us to explore that part of the island more as well. We did a big walk one day over to the public beaches and had an amazing lunch at one of the snack bars just off the water. The public beaches are good to see as most of the island has been taken over by the vast number of hotels here and you’re not allowed anywhere on their beaches. We heard of one sailor’s dingy being let loose into the lagoon after he came ashore at the Four Seasons in search of a beer. I guess if you’re paying $3000 a night for a hotel the last thing you want to see is some scruffy sailor wandering around using your facilities. Then again maybe they should welcome us more. We learn’t five of the major hotels had closed in the past three years and the others didn’t exactly look full. When times are hard around the world $3000 per night hotels seem to struggle for some reason. Weird hey? It does bug me that new hotels are still being built here when 4-5 year old developments are left to rot. Come on people sort it out. 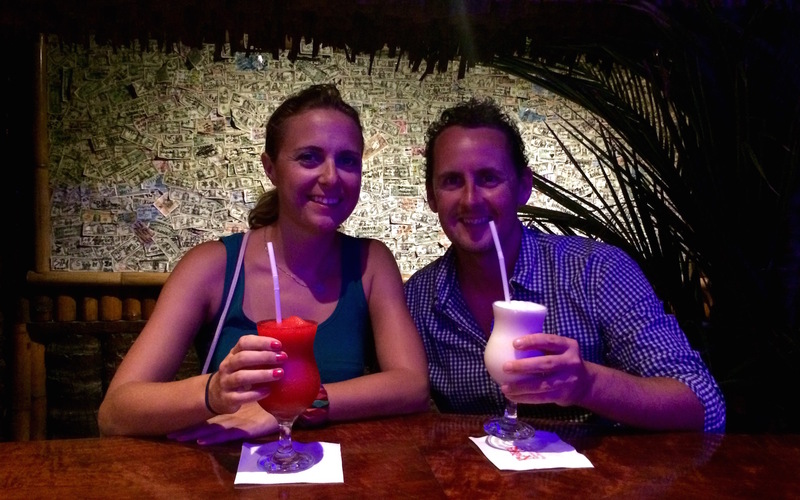 We spent another night or two over at Bloody Mary’s hanging around the beaches and finding some great places to eat. It’s a really different vibe in this area- a lot more how we expected Bora Bora to be. I have to say I wasn’t overly impressed with the place for the first few days but get why people love it now. One thing we really wanted to do here was a hike of the main island and get higher up it’s peaks. We tracked down a guide to take us and set off one morning to the other side of the island. He was very chatty and very proud of what he’d accomplished on the island since moving from France about 14 years ago. Based on what he told us the locals were only living on the areas of land near the beaches so none of the interior of the island had been explored for hundreds of years. 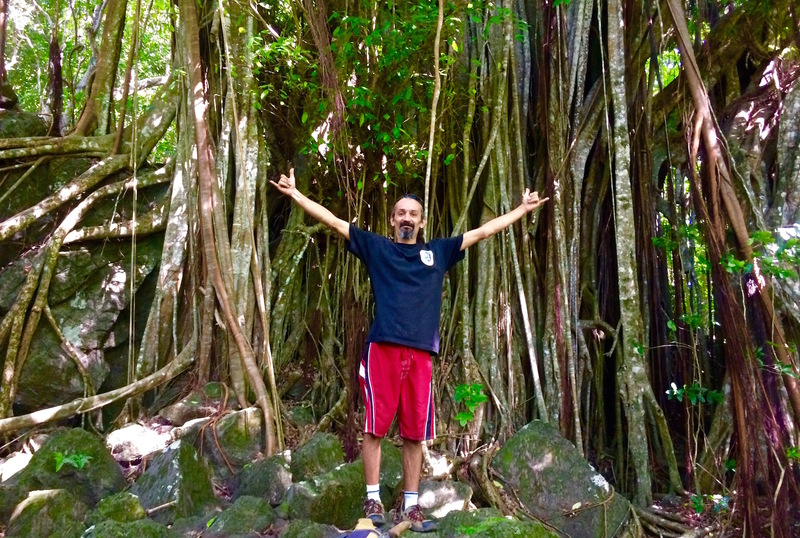 This guy had hacked his way through jungle and found the ruins of whole villages and temples that no one knew still existed. The missionaries pretty much burnt and destroyed everything opposing their religion when they showed up just after Captain Cook arrived so this was very exciting and National Geographic even came out to film his findings. He’s also been trying to get the locals to depend less on imported goods here (which are crazy expensive) and revert back to the old ways of farming the land. He showed us all the areas the ancestors of the island used to grow their food and we left with full backpacks of the best tasting fruit. Afterwards we hiked higher through the jungle and came out to a wonderful view looking down over the reef and lagoon. You can do a hike to the very top of the peaks but he wouldn’t take us due to all the rain. I’m kind of glad as the hike we did partake in ticked every box for us. We moved over to the Mai Kai yacht club that afternoon and picked up a great mooring near the front so rowing the dingy once again would be easy. The yacht club here is really close to town so we can provision well and refuel for the next leg in the trip where once again we’ll be away from services for a while. In good news after taking apart and rebuilding the outboard it started working again! No idea what fixed it but we think it was just some build up on the data pins that connect the parts together. Whatever the reason it’s working well. Woohoo! As often happens one afternoon a boat we got to know in Tahiti came past so we radioed them to welcome their arrival in Bora Bora and to talk of our plans after leaving here. A few people must have been listening in (wouldn’t catch us doing that 😉 ) as 5mins later we had three dingy’s hanging off the back with people talking about the pros and cons of each route. The beers came out and a good time was had by all. And just like that we’d made friends with two other boats, headed out for dinner later with them and were invited to a BBQ the following night. That’s one of the best things about this trip. Out of nowhere these links with other boats form. As we’re all heading the same way we’ll hopefully keep in touch. Just as the weather sucked when we arrived it turned for the worse as we were ready to leave. 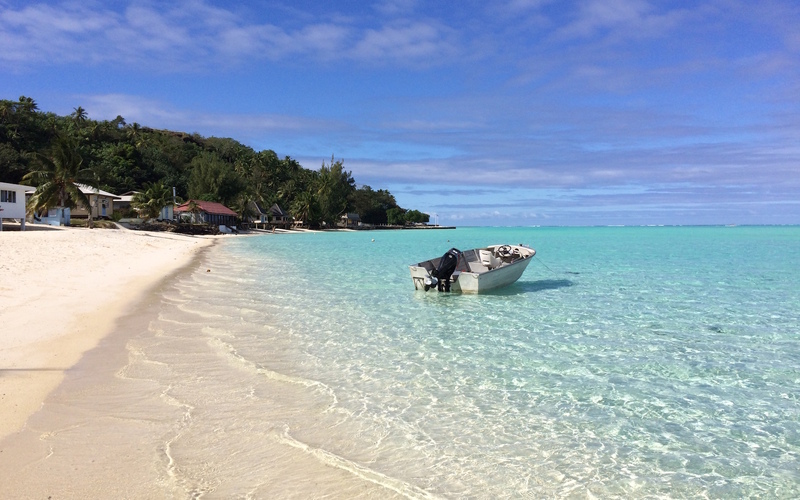 After heading into a very muddy town to clear out of French Polynesia (a process we’d been told would take a few hours/days depending on who we talked to but actually took us 8mins) there was nothing to do but hang out on the boat (which felt worse than it does at sea) and wait for a good weather window. 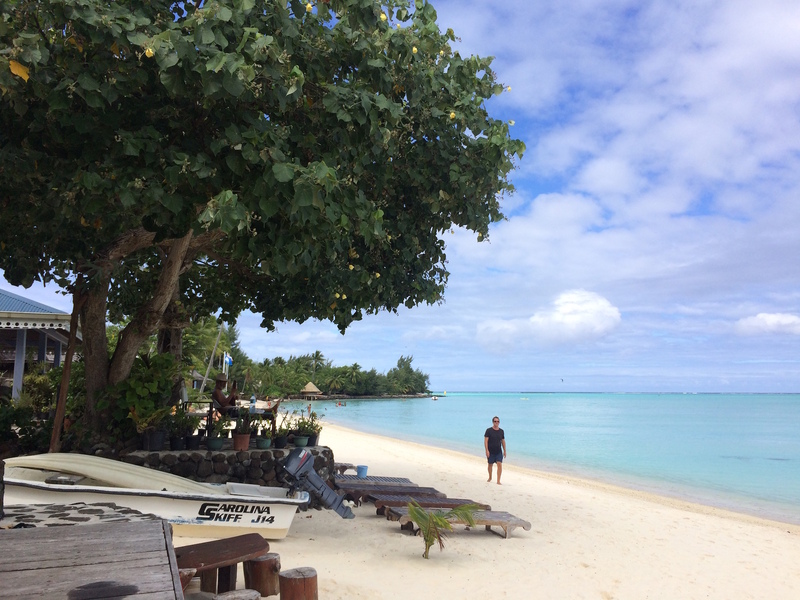 We’ve head eight weeks here in French Polynesia. What a place. What wonderful people. But now it’s time to leave and head the 700 miles or so over to the Cook Islands. 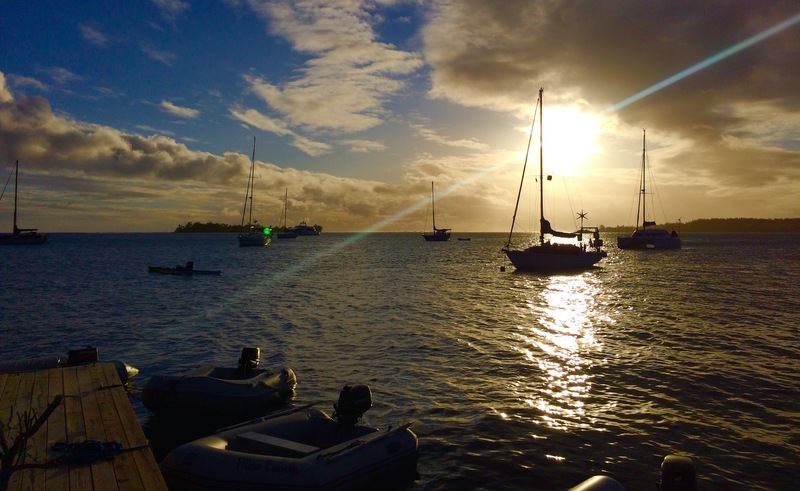 This entry was posted in French Polynesia by Simon. Bookmark the permalink.